ELNA'S GUEST HOUSE has been in business since 2001 and received a certificate of acceptability of the Health Act 63 of 1977. We are registered with the Mpumalanga Tourism and Parks Agency (Act No. 5 of 2005) and also received our registration certificate from the Local Suvekele Tourism Association in 2006. The establishment was graded in 2008 by the Tourism Grading Council of South Africa and received a high *** 3 Star grading certificate which are audited on a yearly base. The guest house is managed with care and friendliness by the Owner and Manager. We offer a high standard for service to our guests and strive to make you feel at home at all times. We are situated in a quiet and safe area with CCTV protection. All parking areas are covered with shade cloth. Each room has its own entrance and en-suite bathroom with a microwave, bar fridge and TV with DSTV. We serve breakfast, lunch and dinner, optional breakfast and lunch boxes are available as take aways. All the rooms are situated to enjoy the most beautiful and peaceful garden. The Lapa is available for anyone who enjoy outside life, "braaivleis" and darts. Braai area and Dart board. Garden available for Wedding and Matric Farewell photos. Bride and Bridesmaids sleepover. Get dressed while you get your photos for your special day done. Garden Available for all occasional photos. 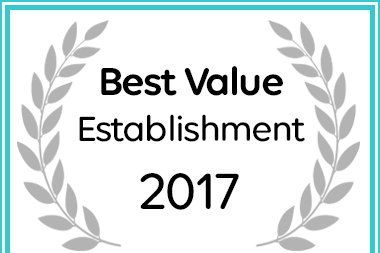 Elna's Guesthouse has been named a Best Value Ermelo Establishment.